Sliders are so much fun, especially if you have little children at your Super Bowl party. But if you can’t eat gluten, it is disappointing to see them on the menu or buffet. When I heard the topic for this week’s Food Network #ComfortFoodFest, I knew I wanted to give you all a gluten-free slider for your parties so your gluten-intolerant or Celiac guests can enjoy everything along with everyone else. The Artist loves Italian meatballs and I thought wouldn’t it be fun to take that concept a little further. 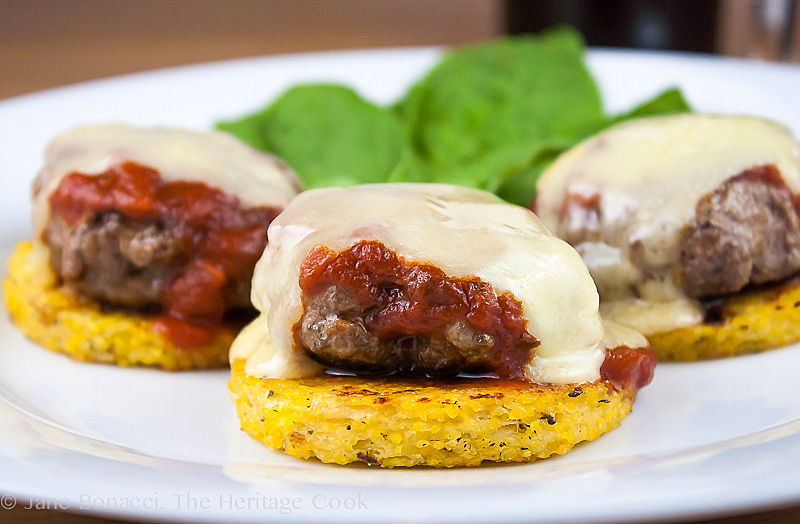 I thought polenta disks would be a great substitution for the traditional hamburger bun. And once we had the mini burgers on the polenta, why not cover them with a delicious marinara sauce and some melted cheese? If you can find mini gluten-free buns, or want to make your own, that is terrific. But give this fun spin on the ordinary slider a try. Serve them open-faced and eat them with a fork and knife. Little ones could certainly eat with them with their fingers if Mom cuts them up first. Who doesn’t love food you can eat with your hands?! This sauce is a basic marinara with wine added so it is fantastic served over pasta or used in lasagna. If you have children who don’t like the taste of wine in their foods, just replace the wine with water. This recipe makes a lot of sauce because I figured if you are going to make it, you might as well get several meals out of your efforts. I always make a big pot of sauce, cool it and then package it in resealable plastic bags. Set them on a baking sheet in the freezer and once they are solid, you can easily stack them in the freezer for instant homemade weeknight meals. The polenta disks, positive and negative images – such fun! It has been a long time since I made anything other than creamy polenta and I’d almost forgotten how much I love to make the firm version and then fry it for a crispy texture. Oh my, it is so good! I wound up with extra after I made all the sliders and am looking forward to figuring out how to enjoy it. In the summer it would be SO good with slices of tomato fresh from the garden layered between circles of the polenta. You could use any fresh vegetables for a delicious and healthy treat. Don’t be afraid of frying the polenta disks. You do not need to add any more fat or oils, so you are not adding any calories, just a lovely crispiness and crunch. I used my nonstick griddle to cook the sliders and polenta and it worked like a champ. If you don’t have a griddle, you can use a large skillet and just cook everything in batches. I also love that both the sauce and the polenta can be made ahead – you can even season and form the sliders ahead too. Keep everything tightly covered in the refrigerator. Then on game day all you have to do is reheat, cook the burgers, assemble the sliders and melt the cheese over the top. It sounds like a lot, but it goes really quickly. You can keep these warm in a low oven for about 30 minutes before the burgers begin to dry out. The basil chiffonade on top makes this even more “Italian” and delicious! Have a terrific weekend and enjoy the Super Bowl. I hope it is a close game with great plays and good refereeing. And make sure you check out all the great recipes from the other bloggers below. And don’t miss the Pinterest page with all the recipes from this season. Enjoy! If you are not used to working with shallots, they are sort of a cross between onion and garlic. They have a subtler flavor than either one and are a favorite in many cuisines. Many shallots grow with two or more lobes, each one wrapped with a covering that needs to be removed before using. Peel them, use a paring knife to make narrow cuts perpendicular to the root end and the cut across those slices to easily mince them. One of my favorite ways to boost plain vegetables is to make a shallot butter and drizzle it over them just before serving. Mince shallots very finely, add to melted butter and cook over low heat for about 3 to 5 minutes or until softened. Use warm. Make sure the polenta you use doesn’t have any added wheat flour. Polenta and cornmeal are naturally gluten-free, but some producers use a facility that also processes other gluten products. Always check the label for safety. Line a baking sheet (with sides) with a sheet of parchment paper and lightly oil the parchment; set aside. Cook Polenta: In a large nonstick saucepan, heat the oil and butter over medium-high heat. When the butter is melted, add the shallots. Sauté the shallots, stirring often until they soften and start to color, about 1 minute. Pour in the stock and bring to a boil. Whisking constantly, gradually add the polenta in a slow stream. If you don’t keep the polenta moving as you add it, you will get lumps. Lower the heat to medium-low or until the polenta is still bubbling and spluttering, but not too heavily. Cook, stirring constantly, for 8 to 10 minutes or until the polenta is thickened and pulling away from the sides of the pan. While the polenta is cooking, stir in the thyme, oregano, salt, and pepper. Remove from the heat and add the Parmesan, whisking until everything is evenly distributed. Taste and add more seasonings if needed. Pour the polenta into the prepared baking sheet and smooth the top with a metal offset spatula, getting as even a layer as possible. Using the spatula, ease the polenta away from the sides of the pan evening up the edges as needed and smoothing. Set aside to cool completely and firm up. Make Marinara Sauce: In a deep heavy-bottomed pot such as a Dutch oven or the pot you used for the polenta (if big enough), heat oil over medium heat. When the oil is shimmering, carefully add onions. Stir to coat evenly with oil. Cook, stirring occasionally until onion is softened and translucent, but not browned, about 3 minutes. Stir in garlic, dried basil, and oregano. When you can smell the garlic, but before it browns (about 30 seconds), add tomatoes and wine. Add salt, pepper and sugar; stir to combine. Bring to a boil. Reduce heat to medium-low or low and let sauce simmer slowly for at least 30 minutes and up to 1-1/2 hours. Add a little water if sauce becomes too thick. If you like a smoother sauce, use an immersion blender to purée. Taste and adjust seasonings. Near the end of cooking, stack basil leaves and slice horizontally into very thin strips. Stir half into the sauce and use rest for garnish. The sauce can be made several days in advance. Store, covered, in the refrigerator and reheat before using in this recipe. Make the Sliders: In a mixing bowl, combine the meat(s) with the seasonings. Take a small amount and fry it in a skillet; when cooked through taste it to check the flavors. If it needs more seasoning, add them and mix gently to distribute. Divide the meat mixture evenly into small balls about 2 oz each, about the size of a golf ball. Without compressing them too much, flatten the meat into patties and press your thumb in the center of one side to create a depression. This will help the patties cook up flat without the usual bulging. Each one will be about 2-1/2 inch diameter. Prepare Polenta Disks: Cut the polenta into circles slightly larger than the sliders (about 3 inch diameter), using a round cookie cutter. Using a griddle or large skillet, cook over medium heat until they are lightly golden brown on both sides. When the polenta disks are crispy on both sides, transfer to back to the baking sheet and place in a low oven to keep warm. Repeat with remaining polenta disks if you are cooking in batches, adding them to the baking sheet as they are done. Do not stack the disks. Cook Sliders: Using the same skillet or griddle you used for the polenta, place over medium-high heat and cook the sliders until just cooked to about medium doneness, flipping halfway through to brown both sides, about 150°F on an instant read thermometer. Insert the thermometer horizontally through the side of the sliders into the center of the patty. It is OK if the burgers are a little less done that you usually prefer because they will be under the broiler to finish cooking. Assemble Sliders: Top each polenta disk with one slider and pour a little marinara sauce over the burgers, about 1 to 2 tbsp. Top each with a slice of the cheese. Slip the baking sheet under the broiler and cook until the cheese is melted, leaving the door to the oven ajar so you can watch and pull them out when the cheese is melted. Remove from the oven, transfer to serving plates and sprinkle with the chopped basil. Serve immediately. Pass additional sauce at the table. Extra sauce will hold in the refrigerator for several days or in the freezer for about three months. Vegetarian Option: You can use leftover polenta for a vegetarian option (if you use vegetable stock). Stack several disks together with a slice of cheese between each one. Bake until heated through and the cheese is softened. Remove from the oven, pour a little of the marinara sauce over each stack and sprinkle the tops with chopped fresh basil. These Italian Sliders look really good. I’ve never really eaten much polenta, but after reading your recipe I’ll try it. Thank you for the great post and recipe. What a fun and elegant slider Jane! I haven’t made polenta in a while, but next time I do, will make extra so I can try these sliders. I have never made polenta before. Is the polenta easy to make? They look really fun and tasty. Hi Tanya – Polenta is extremely easy, just a little time consuming. To make this firm polenta, just keep stirring until it gets really stiff and it will be perfect. I hope you give it a try soon! I love these! How cute and delicious sounding. Perfect. Thanks for sharing! Thank you Erin – they are darling and totally delicious!